The season-six finale of Parks and Recreation, which aired last week, threw me for a loop. Not only did First Lady Michelle Obama guest star, but (spoiler alert!) the ending jumped three years into the future with a tuxedo-clad Ben Wyatt (Adam Scott) preparing for some sort of event with wife Leslie Knope (Amy Poehler), who is now working for the National Parks Service (and donning bangs). Most shocking of all, though, was the fact that Pasadena City Hall was shown sporting a bright green roof! Pasadena City Hall, located at 100 North Garfield Avenue, regularly doubles as Pawnee City Hall on the popular NBC series. Typically, though, only tight shots of the Spanish Colonial-style structure are ever shown. The building’s lavish architecture, especially its crowning six-story cupola, which rises 206 feet above the street, is far too grandiose to represent the main government building of what is supposed to be small-town Pawnee. But in the finale, which was titled “Moving Up,” producers went against the grain and showed the historic landmark in all of its glory. Well, minus its bright red-tiled roof, that is. For whatever reason—most likely some sort of mix-up caused by Larry (Jim O’Heir)—the typically crimson canopy was swapped out for a green one. The landmark, which stands at the heart of the city’s Civic Center District and is listed on the National Register of Historic Places, was designed by San Francisco-based architects John Bakewell and Arthur Brown. Construction on the ornate building was completed in December 1927. Pasadena City Hall’s unique architecture has proved highly versatile onscreen. The building has masqueraded as San Francisco in both Rumor Has It and Charmed, Napa Valley in A Walk in the Clouds, Spain in American Pie 2, Beverly Hills in both Beverly Hills, 90210 and Beverly Hills Cop II, the Middle East in the Mission: Impossible television series, and the fictional European country Tomainia in Charlie Chaplin’s The Great Dictator. City Hall also plays itself each week on The Big Bang Theory—its dome is visible from the apartment window where Caltech physicists Sheldon Cooper (Jim Parsons) and Leonard Hofstadter (Johnny Galecki) live. It is no surprise that the structure has made its way onto the screen so many times over the years. To borrow a line from Chris Traeger (Rob Lowe), Pasadena City Hall is literally one of the most beautiful buildings in all of L.A. 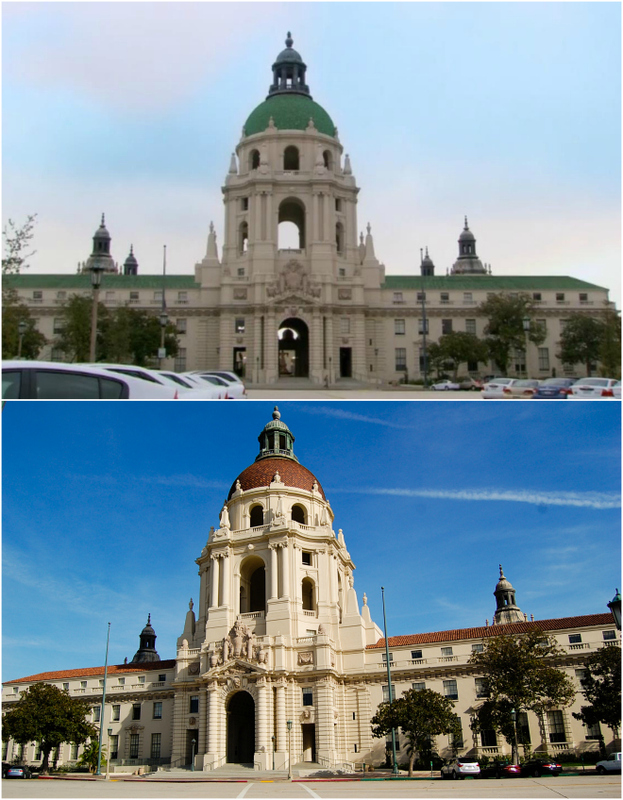 Photos: A screen capture from the “Moving Up” episode of Parks and Recreation (top) and a photograph of Pasadena City Hall taken in November 2008 courtesy of Mike Flores (bottom).